I live in beautiful Austria and I call myself lucky being surrounded by abundant nature and mountains. My eagerness longs for more pristine landscapes, though – travelling into the High Arctic is my passion. My enthusiasm for the cryosphere dates back to my childhood. At the age of seven I went up the Alps via the “Großglockner Hochalpenstraße” with my parents and my brother. From a childs‘ perspective, we were exposed to daring adventures and dangers: right beside the single track road, steep valleys seemed to pull us down to certain death. We saw drivers who were anxiously looking at the steam coming out their car engines. We walked on the glacier called “Pasterze”. It is the largest glacier of the eastern Alps. There, ice cold air was blowing under our Lederhosen and Dirndl. At the upper part of the 8 km long glacier we spotted masses of ice tumbled down from the highest 3000 m peaks. In 2014, when I travelled the same route with my wife in search of childhood memories, the Pasterze had shrunk into a dirty piece of ice. The past centuries caused a fundamental change which led to the death of even the largest Alpine glaciers! As a result of the childhood trip noted above, my curiosity about the Earth’s cryosphere increased considerably. My stories in Frozen Latitudes describe experiences and encounters with animals and human-beings. The photos were taken over a period of nearly 30 years and were developed with minimal editing, in order to preserve the original mood which is an important aspect of my Pure Landscapes paradigm. Black and white photos explicitly play with shadows and structures to make an artistic, partly poetic statement. I still let the original message of the photo stay unchanged. Frozen Latitudes is also a call for more humility and a plea for us all to pay attention to the cryosphere and the importance of it being preserved for future generations. My pictures and essays seek for the essence of life: Events that do not fade with each passing second. Moments remain only for those who were present there. So, photos help keeping memories alive. They capture also seemingly insignificant moments. Because who can judge for others what gives meaning to life? To me, landscapes provide inspiration and insight. I’m seeking virtually the soul of landscapes I wander through. Thereby space and openness come from immersing into the now. The present moment. 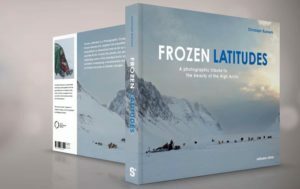 The fine art book “Frozen Latitudes” is my photographic tribute to the beauty of High Arctic landscapes. This area is undergoing a fundamental change by becoming un-frozen due to climate change. Photos of the High Arctic landscape’s paint a picture of the earth’s Genesis where landscapes are exclusively created by natural forces. These are wind, water, ice and snow. My photos highlight the incredibly beautiful landscape in the High Arctic such as Greenland. This area consists of simple, naturally shaped forms which have been created over millennia.